Gone are the days you stand in the long lines at Starbucks in 90 degree weather craving an ice cold latté. Well, maybe not really, but if you want to break your addiction this summer, I came up with a much healthier alternative. This is a nice and refreshing drink I made right before I started my detox. Besides the Silk Iced latté, all the ingredients are clean. If you are following a clean eating diet, I'd suggest substitute the Silk Iced latté with almond milk. It's delicious, healthy and refreshing at the same time! I'm not just going to say this 8 oz.drink is healthy without giving you the skinny on each ingredient so lets dip into the facts first. Cocoa nibs are a good source of potassium, chromium, copper, calcium and zinc. Cocoa nibs are also a rich dietary source of magnesium, a mineral that many Americans lack. Magnesium is essential for circulation, muscle function and bone health, but it can't be produced by the human body. Read more benefits here. I purchased these at Whole Foods for $13, but I suggest buying them at your local food co-op. I visited mine a few days later and they were $7.99. Never again, Whole Foods! Almonds naturally contain a very high amount of vitamin E, which blocks the formation of carcinogenic compounds formed in the body that can result in cancer. Almonds are also packed with essential fatty acids that promote good health and well-being. The essential fatty acids found in almonds are linoleic and linolenic acid, and they are responsible for proper functioning of the body. Read more benefits here. 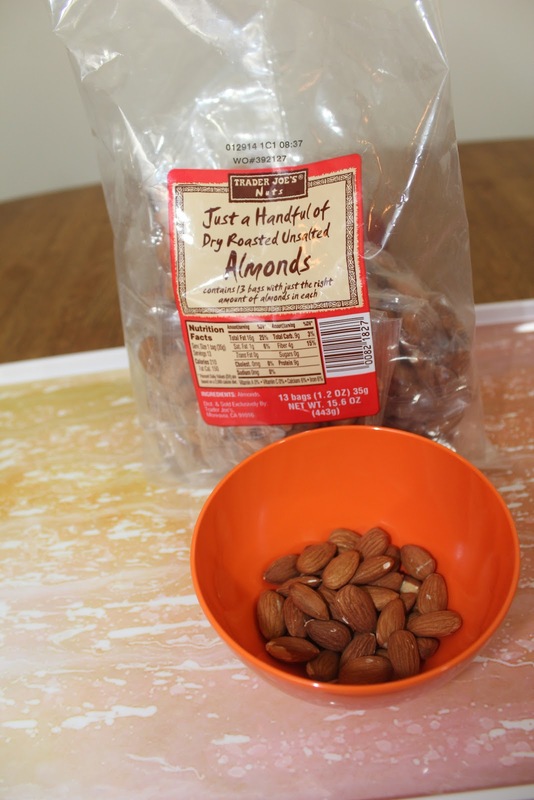 I love the "Just a Handful of Dry Roasted Unsalted Almonds" from Trader Joes because they come prepackaged so it cuts out the work for you. I always keep a pack in my car when I'm on the go and need a quick bite to hold me over until my next meal. Flaxseed, which is high in fiber and omega-3 fatty acids, is often used to support digestive health and relieve constipation. However, consuming flaxseed has many other health benefits when eaten regularly.Read more benefits here. I usually buy the milled flax seeds with dried blueberries to sprinkle over my steel cut oatmeal for breakfast. It tastes really good paired with a dollop of honey. I'd recommend blending the ice first, then the nuts followed by everything else. I loved this drink using both the Silk Vanilla Latté and almond milk. I even had Derek taste it and he also gave it his stamp of approval (which is rare. I'm still trying to get him to give chia seeds a try, smh!). So if you try this drink or have tried something similar, let me know how you liked it in the comments below! Do you have to add any type of special flavor with the almond milk or do you just mix it like you did? Did you use the vanilla almond milk or just regular almond milk?